How to prevent and minimize damage. Timeline - How to spot damage through the year. Plant resistant varieties. Some viburnums are more resistant to this pest than others. Visit our preliminary list of susceptible and resistant species. Beneficial insects help control viburnum leaf beetles. 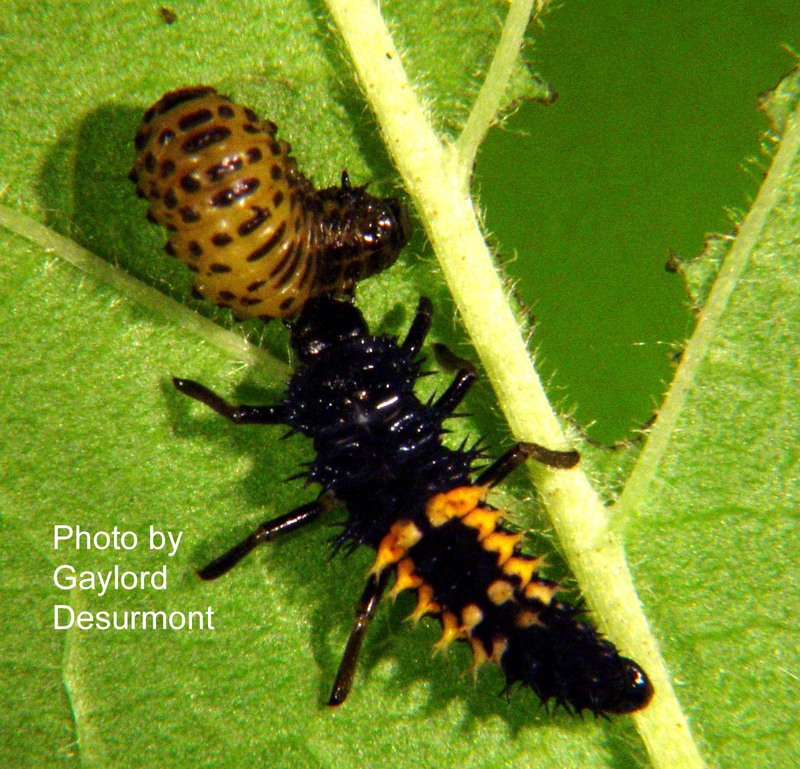 A lady beetle adult feeds on larvae (above), while certain stinkbugs feed on adults (below). Remove egg-infested twigs. Egg-laying sites are easiest to spot when viburnums are leafless. Look for infested twigs between early October and mid-April and prune them out. This is probably the single most effective measure you can take to limit beetle populations. More information and pictures of egg-laying sites. Encourage beneficial insects. 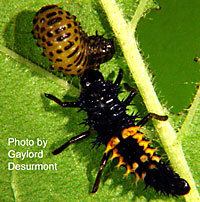 Several generalist predators feed on viburnum leaf beetle larvae including lady beetle adults and larvae, lacewing larvae and spined soldier bugs nymphs. 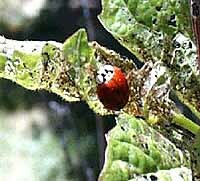 The lady beetle adults and spined soldier bug adults also eat adult viburnum leaf beetles. Encourage these and other beneficial insects by avoiding broad-spectrum insecticides and maintaining diverse species of plants for beneficial insect habitat near viburnums. Initial investigations by Cornell researchers on these biological control options also indicate that augmenting natural populations of these predators may dramatically limit viburnum leaf beetle damage. Researcher continues in this area, check back later for more information. Foil larvae. Researchers recently learned that the larvae don't drop from the leaves to the soil to pupate. Instead, they crawl down the tree. While it hasn't yet been tested, it is likely that putting a sticky barrier such as Tanglefoot tree pest barrier around the base of the shrub could keep larvae from reaching the soil to pupate. Pesticide options. Some insecticides are registered for use to control viburnum leaf beetle. Most (including organic pyrethrins) contain contact poisons which can also kill beneficial insects that help keep viburnum leaf beetles in check. Alternatively, organic pesticides derived from the fungus Saccharopolyspora (spinosad) and insecticidal soap have effectively knocked back viburnum leaf beetle larvae with less damage to beneficial insects. Both spinosad and insecticidal soap are contact pesticides that require direct contact with the pest. The most effective way to use contact pesticides is to spray when larvae first emerge (the younger the better), usually in late April or early May. Before spraying, inspect plants to make sure larvae are present and be certain to make a thorough application that directly contacts the larvae which feed on the undersides of young and emerging leaves. Spraying adults or eggs is far less effective. Initial field trials conducted by Dr. Paul Weston also indicate that horticultural oil sprays applied to egg laying sites might reduce egg hatch by 75-80%. Horticultural oil is highly refined petroleum oil that is mixed with water and is sprayed on to coat and suffocate eggs. It is most effective when a high rate of oil (4%) is used. However, this high rate of oil can burn plant foliage so apply only before viburnum leaves emerge; mid-April is usually a safe time to make the application because the leaves usually emerge in early May. Adjust the application time to suit plant development in your area. For more information on using horticultural oil and insecticidal soap, see New Tools for Taming VLBs. Check local regulations, carefully read labels and follow instructions precisely. Check with your local Cooperative Extension office office for more information. Some pest control professionals (outside of Long Island) use soil-applied systemic pesticides that are absorbed by the plant. These are targeted more directly at the pest and are generally less harmful to beneficials. For specific pesticide options, see the Department of Entomology's Viburnum Leaf Beetle factsheet, under the heading Management Recommendations. "The viburnum leaf beetle hit us hard in the Rochester area about 15 years ago. During those first few years in which the beetle population peaked most of the susceptible native species like arrowwood, that were growing in wooded areas, were killed. Some landscape plants succumbed to the defoliation then too. "At that time I would not have recommend planting a susceptible species like the Cranberry bush viburnum. Now however the populations of the beetles are down significantly and it is safe for us to plant species again like cranberry bush and arrowwood viburnums. They’ll get a little bit of damage but nothing lethal. "Why did the populations go down? It seems with all the very susceptible native plants that were around initially allowed the populations to reach unnaturally high levels and the beetles moved into landscapes annually. With those food sources gone the populations declined. Also, and maybe more importantly, predator insects, and nematodes that affect the larva in the soil have built up and found the Viburnum leaf beetle as a food source! 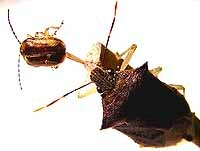 "This insect went through southern Canada about 30 years ago and they have experienced a similar situation. Now it’s okay to plant susceptible species again, just expect a little leaf feeding."